I’ve got no wish to offend anyone’s delicate sensibilities with a virginity pun right off the bat. I couldn’t pass up the opportunity, though, so if you’d rather your gardening and cooking information be left untainted by the mention of carnal delights, I do hope you’ll recover. GARLIC. My love for the allium plant family is fairly intense, and goes back to my childhood, when I was often beseeched by my mother to please, please, not put quite so much garlic and onion powder on my morning piece of toast. Apparently it smelled up the house pretty effectively. Over the last couple of years, my household has developed an appreciation for garlic scapes, the flower stems of the garlic plant. See those little curlicues? Those are garlic scapes. They shoot up from the plant in late spring here in the Northwest, and, if left to their own devices, will bloom prettily. The problem with that flowering is that it takes away energy from the plant that could be directed toward producing a healthy garlic bulb under the ground. 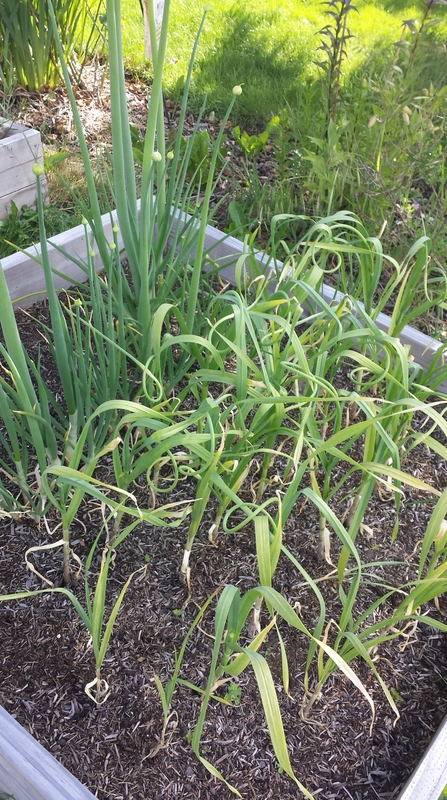 As a mild sustainability nerd and lover of quality, tasty food, I want to give my garlic plants as much of a shot as possible at a successful harvest that will last us for months (hopefully the whole year – this is my first year growing garlic, so we’ll see if I planted enough come July). Deflowering the garlic, therefore, is necessary for a bumper crop of top shelf bulbs. 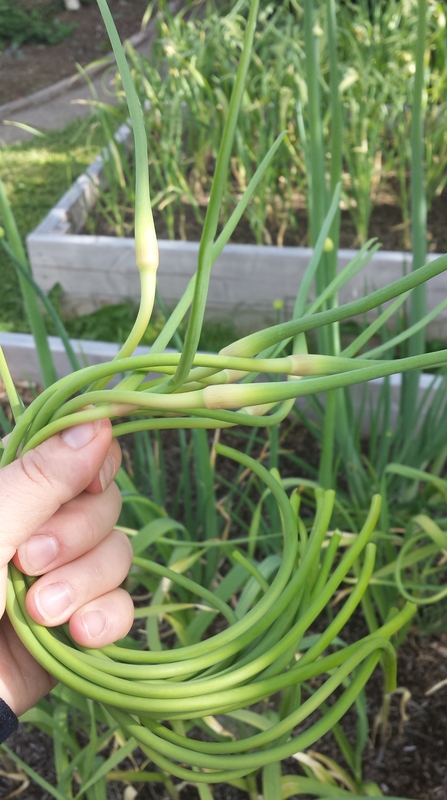 Happily, the scapes are edible and similar to green onions; they impart a mild, garlicky flavor to any dish in which you’d normally use garlic. That means it’s pesto time! To harvest the scapes, I just followed each curlicue down to the joint, if you will, of the leaves and used my thumbnail to snip them off. Alternately, you can get these for $1-2 per bunch at any farmers market this time of year, or at Whole-Foods-type markets that sell local produce. Pesto is fantastic. Take almost any green, throw in olive oil, garlic, lemon juice, salt, sometimes cheese, and sometimes nuts, and there you have it. A flavorful, multi-purpose food for your dipping, spreading, and pasta-accessorizing pleasure. 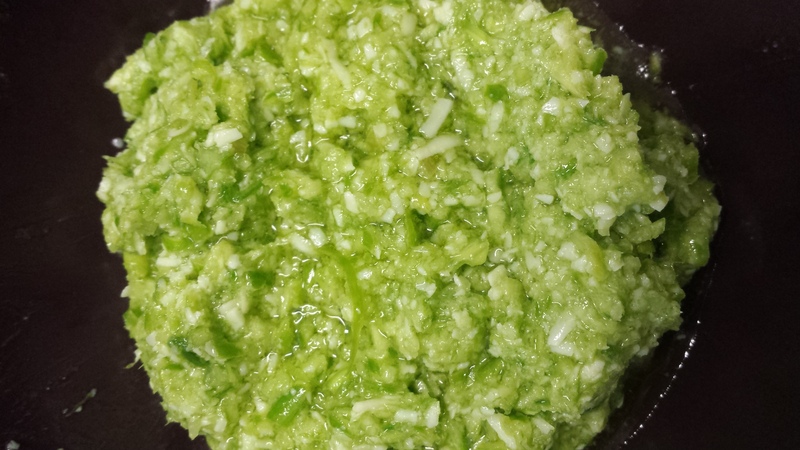 I call it the “guacamole of the Italians.” Garlic scapes have the distinct advantage of being both green AND garlic (two of the main components), so it makes perfect sense to pulverize them into pesto. I took my humble handful of scapes, nearly a quarter pound, and put them in a food processor after a rough chop with the kitchen shears. I added just shy of 1/2 cup of California olive oil. If you are following this recipe, you’ll definitely want to use the best olive oil you have – not only will that provide your pesto with a fantastic, bright flavor, you will also be relieving yourself of involvement with the nefarious workings of the Mafia. 🙂 I squeezed the juice of half a lemon in along with the scapes and oil, and let the food processor do its thing. I stopped once the mixture was still pretty roughly incorporated. I like a pesto with some chunk. You, of course, can blend until your heart’s content. I blended in a generous pinch of celtic sea salt and about 2/3 of a cup of asiago cheese I had finely shredded with a microplane. Parmesan cheese is the variety typically used to make pesto, but any hard, aged Italian cheese will do just fine. Pecorino romano is fantastic if you’re into sheep’s milk cheese, or have a difficult time digesting lactose. If you’re vegan, you can leave out the cheese altogether; just make sure you have good quality salt and good quality olive oil, because those flavors will shine through without the cheese. A handful of cashews is also a great way to enhance the taste and creamy texture of vegan pesto. 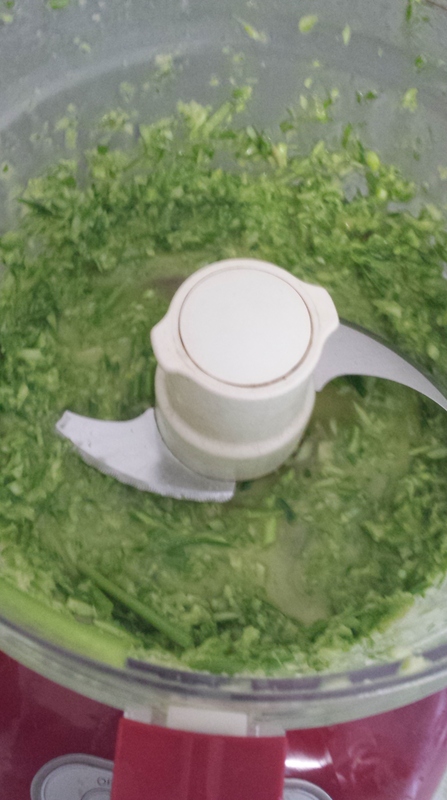 You’ll want to use the pulse setting on your food processor, so the mixture doesn’t liquefy. Spread of the gods. 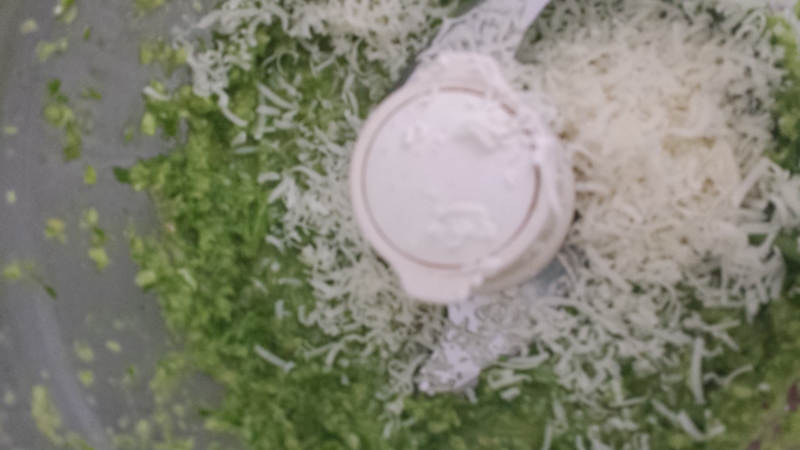 Guacamole of the Italians. It’s over. It’s done. It couldn’t have been easier. 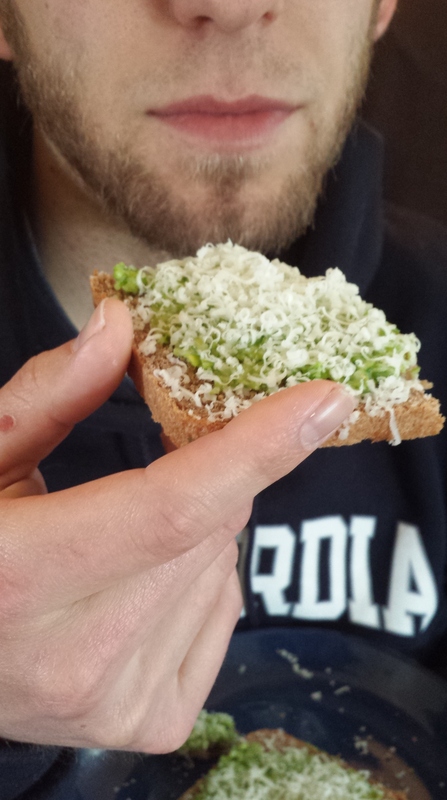 I spread a generous amount of the stuff on a slice of soaked whole wheat rosemary bread my husband made yesterday, toasted it, then sprinkled a little more asiago cheese on top. Perfection. Snip the scapes into manageable pieces, just enough that you can shove them into the food processor along with the olive oil and lemon juice. Process for 30 seconds, then check to see whether the mixture is at your preferred consistency, scraping down the sides of the processor if needed. Mix in the cheese and salt using the pulse setting. When everything is blended, taste and adjust ingredients as needed. For a thicker texture, add more scapes or cheese. 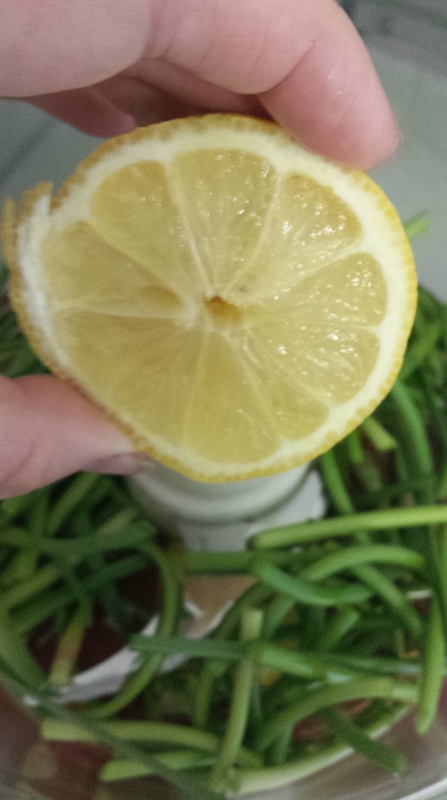 For more tang or flavor, add lemon juice or salt. For a thinner texture, add olive oil. This recipe makes enough for eight generous servings if you’re spreading it on toast or sandwiches, or six large servings if you’re dressing pasta. Go crazy. 26 May	This entry was published on May 26, 2014 at 6:33 pm. It’s filed under Collection and tagged garlic scapes, olive oil. Bookmark the permalink. Follow any comments here with the RSS feed for this post. mouthwatering. Can’t I just eat at your house all the time? When the price of pine nuts shot up I substituted sunflower seeds in my pesto. No one noticed. Saved about a million dollars. I love sunflower seeds but have never thought to use them in pesto! What a great idea.